Take the OffBeat Poll - Win tickets to see JJ Grey & Mofro at the Orpheum. 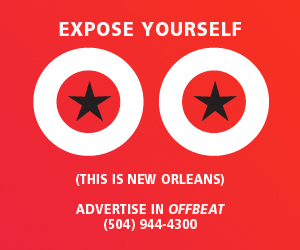 How many visitors will you have staying at your place this Jazz Fest?… Take the OffBeat Poll! If you take this week’s OffBeat Poll, you’ll get a chance to win a pair of tickets to see JJ Grey & Mofro perform at the Orpheum Theater on Friday, April 26. The winner of a pair of tickets to see Raw Oyster Cult perform at Tipitina’s on Saturday, April 20 was Joanne Schmidt. Congratulations! A millionaire suing a club because it does what it legally has a right to do. How bad would it be to hear Tom McDeratt in your back yard? When I’m in New Orleans I go out nearly every night. When I get back home to a certain ultra-grey, coffee-soaked, northwest city with America’s 4th Worst Traffic and 171st Worst Drivers, I pretty much stay home. When I do go out it’s mostly to hear touring New Orleans and blues musicians. Last year I ambitiously tried hitting three of those festivals in the same weekend. (Wish they weren’t all stacked up like that!) Got in the first two days of Voice of the Wetlands, which was superb. Then headed for the Cattle Fest in Abbeville, which I’d had a blast at the previous year. But there ain’t much happening on a Sunday in Abbeville, and the fest was pretty much wound out. So, I headed for Lafayette and caught the last four hours of Acadiens et Creoles. Major fun! But yowza, what a commute! at least ONE of the big names should be a jazz great, what are these people even doing at jazz fest? we have had some killer jazz shows in the past, all packed to maximum overflowing capacity so what happened this year? I hear ya. I started attending jazzfest in 2000 and it’s never been as comfy as it was that year. I’ve always been a major nightowl so generally I’ll go for ten days to catch both weekends but I’ll only go to the festival grounds about 3-4 days cause I have way more fun in the club’s dancing til dawn each night to all my favorite Nola bands/musicians and the many guests coming to sit in. I can spend every night at the maple leaf, Tips, Blue Nile, dba, republik, and Howlin wolfs..and be the happiest camper while feeling like I’m not missing out on much of anything at the festival grounds. A few days at the festival is a must but for me, the club’s are where it’s at For the real flavor of Nola. 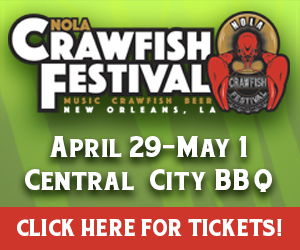 SO many people fly in to NOLA for the FQ Fest now that it may seem appropriate to send out the schedules earlier, but being a free festival brings it’s own crowd issues. Last year I wanted to see Dr. John like everyone else, but we were perched at the zydeco stage. When we hurried over to see Dr. John we could not get anywhere close enough to see anything – the crowd was terrible. On the other hand, I would not have wanted to be trapped inside that crowd, either. So we went back to the zydeco stage – I’m just glad that we left our chairs there to return to. So, yes, as a visitor for FQ (which in some ways I enjoy more than Jazz Fes), I would appreciate set schedules sooner. But I now have more realistic expectations if more big names like Dr. John perform there. I still say MOVE THE CRAWFISH TO THE ZYDECO STAGE area!!! Been going to FQF since 1997! loved it so much my wife & i decided to purchase a timeshare in The Marigny & we’ve been back almost every year since. the crowds have definitely grown enormously as more people discover the greatest free festival on earth! while we don’t love the over crowding, theres no place we would rather be than NOLA !!! I took my fema $200 and bought lifetime subscription. I have no idea who to thank. But thanks.